Wastewater Recovery Systems Market size for 2016 was valued over USD 20 billion and is predicted to expand over 8 % by 2024. 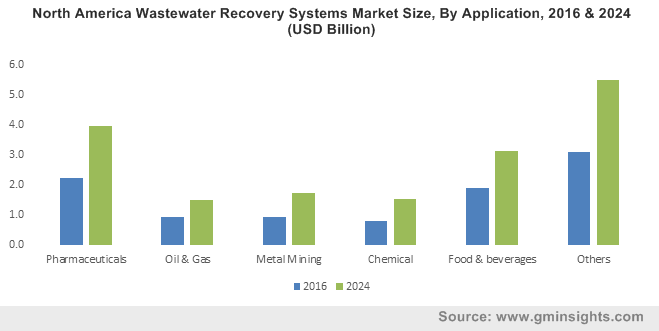 Global wastewater recovery systems market will witness an appreciable growth on account of burgeoning water demand and inadequate water resources. Population growth, urbanization, changing consumption patterns, climate change, and industrialization have led to a global water scarcity. According to the UNESCO, over two-thirds of the global population currently lives in the areas experiencing water shortages for at least one month a year. Stringent regulatory regime enforcing the adequate discharge of waste will stimulate the market size. For instance, the U.S. EPA has issued Effluent Guidelines as the national regulatory standards for discharged waste to surface waters and municipal sewage treatment plants. The prevalent wastewater regulations along with strengthening global agendas on water resource management will continue to intensify the industry growth. Shifting trends toward green industry to utilize waste as an economical & environmental resource will propel the global market growth. The deployment of these systems through industrial symbiosis primarily across the eco-industrial parks is gaining significant prominence. Expanding industrialization coupled with mounting compliance costs will further complement the business outlook. 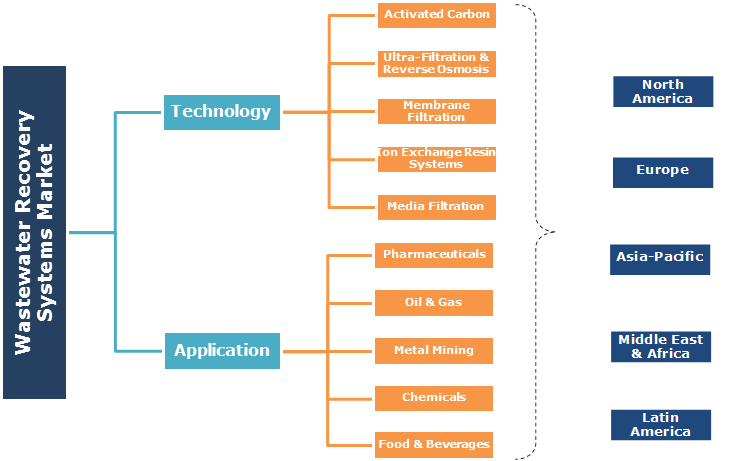 Membrane filtration wastewater recovery system market is predicted to expand over 9% by 2024. Declining membrane costs along with their increasing operational efficiency will enable the technology expansion across diverse water treatment solutions. Continuous technological advancements coupled with increasing stringency of water quality criteria will further stimulate the technology adoption. Ability to offer relatively lower operational costs will encourage the adoption of ion exchange resins wastewater recovery systems. These systems are extensively deployed across nuclear facilities, industrial processes, and medical & pharmaceutical operations to maintain the purity of water by eliminating the undesirable ions. Media filtration wastewater recovery system market will witness growth on account of its wide applications spectrum and operational suitability. Ability to provide an efficient and compact way to treat industrial wastewater for safe discharge or recycling will strengthen the technology use. The process can be employed for the elimination of macromolecules or particulates from raw water to produce potable water. Food & beverages wastewater recovery systems market in 2016 was valued over USD 5 billion. Growing consumer affinity toward processed food along with increasing water usage will augment the industry growth. Escalating measures to meet high-water input needs while minimizing production costs across these industries will positively impact the business outlook. Strict environmental norms to reduce the detrimental effects from mine processes will drive the metal mining wastewater recovery systems market. Shifting trends toward Zero Liquid Discharge (ZLD) along with an effective extraction of minerals from waste streams have contributed to the rising demand for these systems. Pharmaceuticals wastewater recovery systems market will witness strong growth on account of rigid disinfection & purification specifications applicable globally. The installation of these systems to obtain a highly efficient and cost-effective supply of water will support the industry growth. The U.S. wastewater recovery systems market size is anticipated to expand over 7 % by 2024. Stringent effluent standards & water discharge criteria across diverse industries will propel the industry growth. For instance, the Federal Clean Water Act requires companies to obtain special permits for the release of treated wastewater into the water streams. Aging wastewater treatment infrastructures along with the declining existing water resources will further complement the business scenario. Europe market will grow on account of a comprehensive legislative framework toward waste handling. Regional legal instruments including the EU Water Framework Directive and Urban Wastewater Treatment Directive, are substantially strengthening the deployment prospects for these systems. Germany, the UK, France, and Italy are some of the prominent EU members with extensive waste recovery infrastructure. Strengthening initiatives toward cleaner economy with a growing emphasis on environmental protection and green industries will drive the China market. In 2015, China under its 13th Five Year Development Plan introduced the amended Environmental Protection Law to conserve its national water resources. The national government further introduced a new rigorous discharge standard for wastewater treatment plants in the country. Notable industry participants include Veolia, SUEZ Environnement, Kontek Process Water Management, Evoqua Water Technologies, Mech-Chem, ClearBlu Environmental, Vinnolit, CLEARAS Water Recovery, Dynatec Systems and others. Cost competitiveness, regulatory conformance, distribution network and product differentiation are some of the crucial strategic assets to secure a competitive position across the industry. WRS treat and recycle wastewater generated by production and manufacturing operations, which can be reutilized across industries with a minimal impact on the environment. These systems are widely installed across industrial locations to treat discharged water for recycling, reuse and recovery. Growing industrialization across the emerging economies along with strict government norms toward water discharge will stimulate the industry growth.